Pancrezyme (Generic Viokase-V pancreatic enzymes) is used in the treatment of pancreatic insufficiency or maldigestion syndrome. It is used in dogs and cats and is available as tablets and powder. Pancreatic enzymes are a collection of secretions from the pancreas that are given to animals whose pancreas has stopped functioning. They are necessary to digest fat, protein, and sugars. The product is generally made from pig pancreas. Dogs and Cats: Pancreatic enzymes are used as a digestive aid for the treatment of exocrine pancreatic insufficiency (maldigestion syndrome). 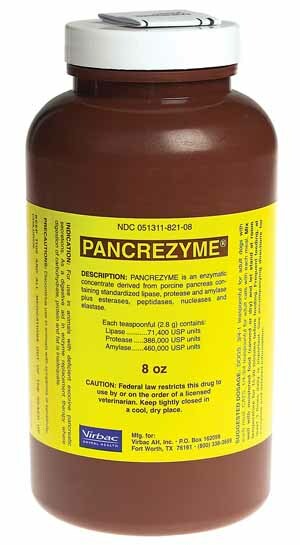 Pancreatic enzymes must be supplemented in cases of pancreatic enzyme deficiency. Rabbits: Pancreatic enzymes may be used to aid in the treatment of gastric trichobezoars (hairballs) and GI stasis. Birds: Pancreatic enzymes are used for the treatment of exocrine pancreatic insufficiency and maldigestion. Dose and Administration: Always follow the dosage instructions provided by your veterinarian. If you have difficulty giving the medication, contact your veterinarian. In most cases, your veterinarians recommendations will be to mix the powdered form of the enzymes with the food. If feeding dry food, moisten the food with warm water and then add the enzymes. Be sure to allow the enzymes time to work; usually the food and enzyme mixture is allowed to stand 15-20 minutes before feeding. If using the tablet form, administer the tablet before the meal. Feeding several small meals a day is usually recommended. If you have any questions regarding how to use this medication, contact your veterinarian. If you miss a dose, skip the one you missed and go back to the regular schedule. Do not give 2 doses at once. This medication should only be given to the pet for whom it was prescribed.